For an additional $15.00 this print can be autographed by William Hallmark. Image size is 8 5/8" x 6 5/8". Standard shipping is $12.00. For an additional $15.00 this print can be autographed by William Hallmark. Overall print size is 16 1/4" x 12 1/2". Standard shipping is $12.50. 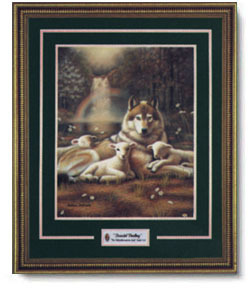 Overall print size is 23 3/4" x 18 1/2". Standard shipping is $15.00. "The wolf will live with the Lamb." Creation has come together to present a picture of utter contentment. 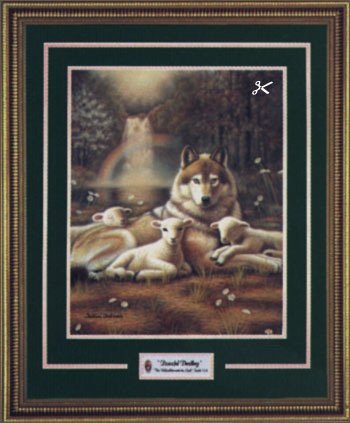 A wolf rests with three lambs in front of a waterfall highlighted by a rainbow. Civilization exists as never before in a utopia spoken of directly by Isaiah. In an uncertain world this is a time which we look forward to in anticipation, a time of peaceful dwelling. Peaceful Dwelling copyright© by William Hallmark.